My brother and I decided to make Christmas gifts this year to exchange. Naturally, I had to do a recyling project. 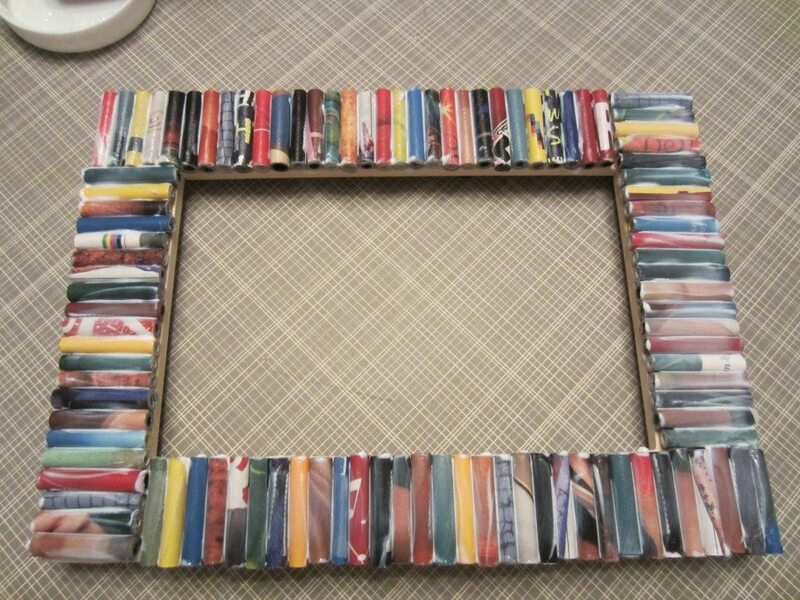 I have always wanted to try making something out of recycled magazine pages so I finally sat down and made this frame. I have to say, although slightly tedious, it was quite fun, especially when I looked at the results. My only regret is that I wished I didn’t use such a cheap wooden frame mainly because of the cardboard back. I should have shelled out a few more bucks for a nicer one. Even a thrift store one would have been better. Oh well. 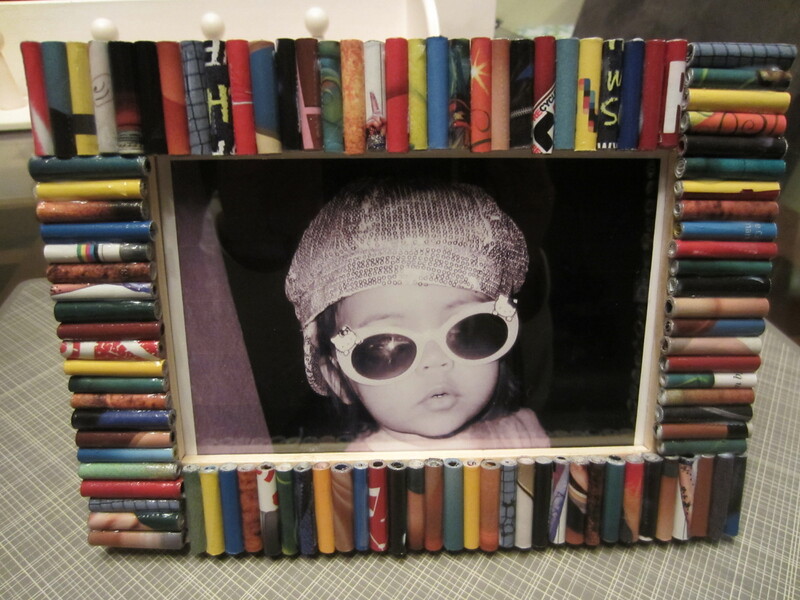 Anyway, here is how I made a recycled magazine frame. 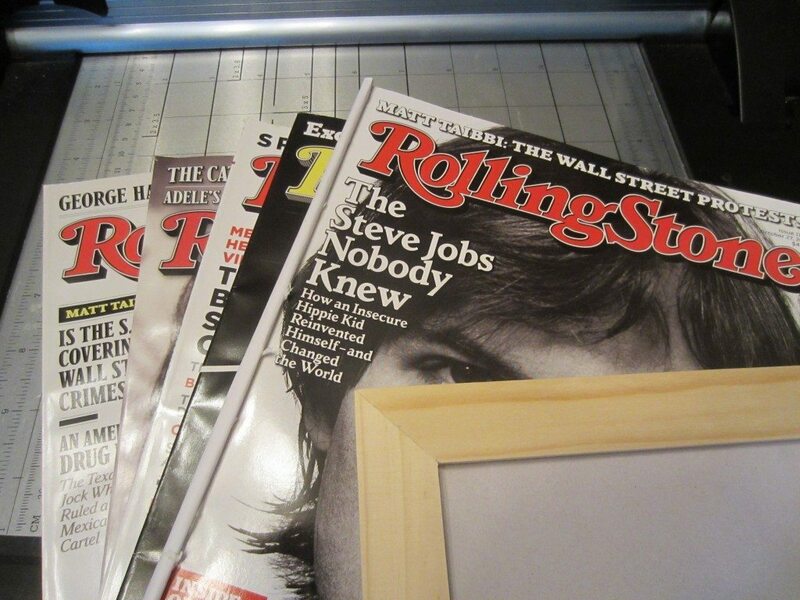 Gather a few magazines that you’ve already read and no longer want. I say a few, because for this project I used four different Rolling Stones magazines to get the colored pages I wanted. I chose to cut my strips to the width of the frame. 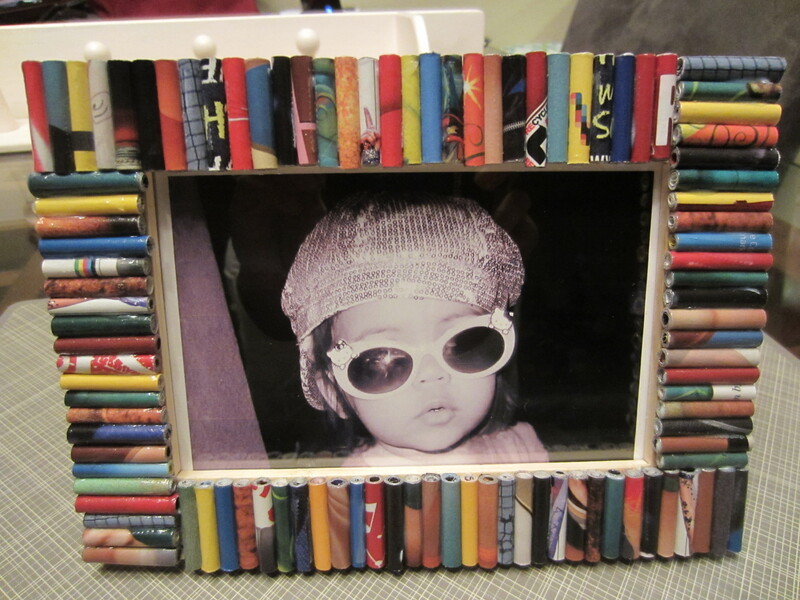 For example, the frame pictured here is for a 3X5 photo and the frame is a one inch wide, 4X7 frame. I ended up cutting 1”X7” stripes (approximately eight pages). Next, start rolling your strips. The toughest part is the beginning; however it’s easy to get used to! I used a small narrow piece of tape to secure each roll. 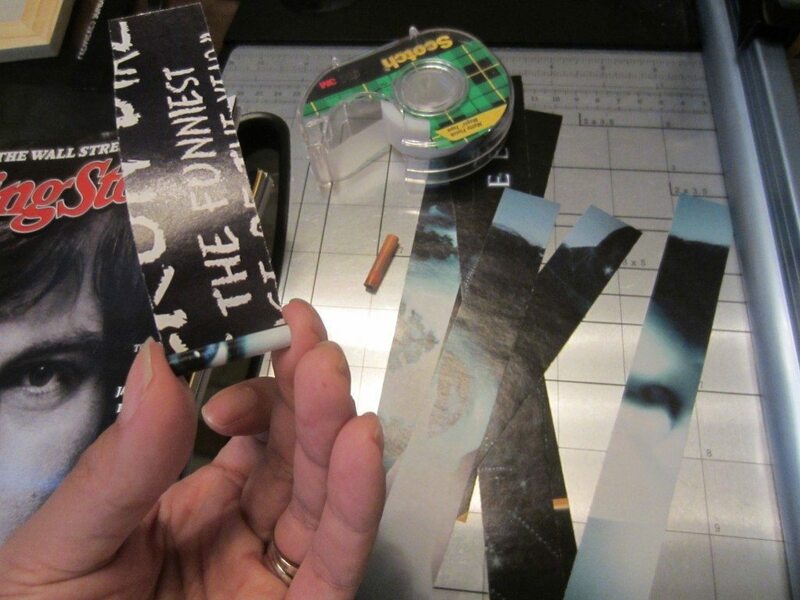 It was cleaner than attempting to glue each roll; and the tape can be easily hidden when attached to the frame. For each roll, I laid it onto the frame so I knew when to stop. It helps to do this while you’re watching your favorite shows on TV. After rolling all the strips, I glued each piece with a paint brush and decoupage medium one by one. 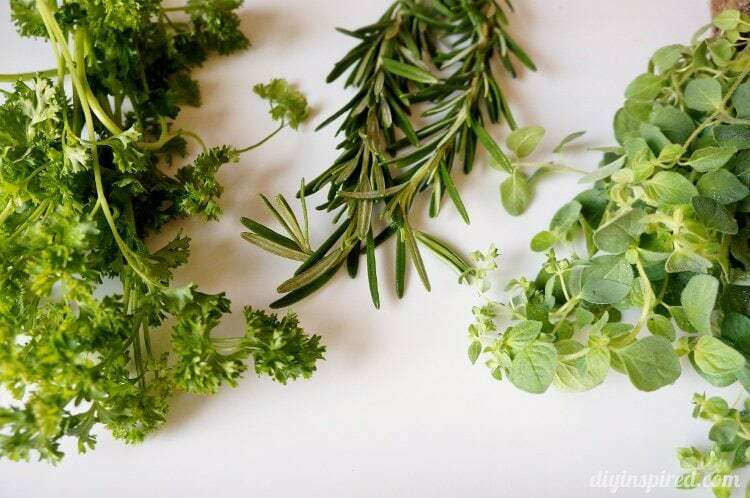 When you are finished adhering each roll, allow it to dry completely (about 15 minutes). Then, I used 2 coats of decoupage medium on top. Allow it to dry between coats. Insert your picture, and there you have it! 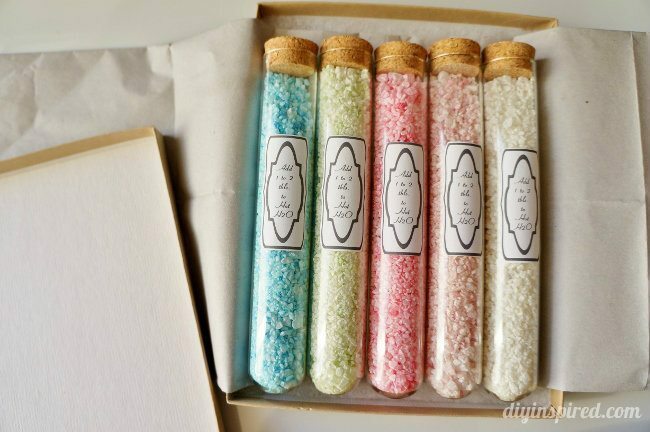 The perfect handmade gift! By the way, I had to show my little plug to recycle. If you look closely on the top left side of this picture, you will see what I mean! ***I heart comments! If you have any comments, ideas, or suggestions, please feel free to comment below. Is there a craft project you want me to try? I’ll gladly do my best to take on your craft challenge and I’m always looking for new ideas! Just let me know! Also, if you have a project you’d like to share, please email me at dwulf@diyinspired.com. I like the black and white picture in a colorful frame. 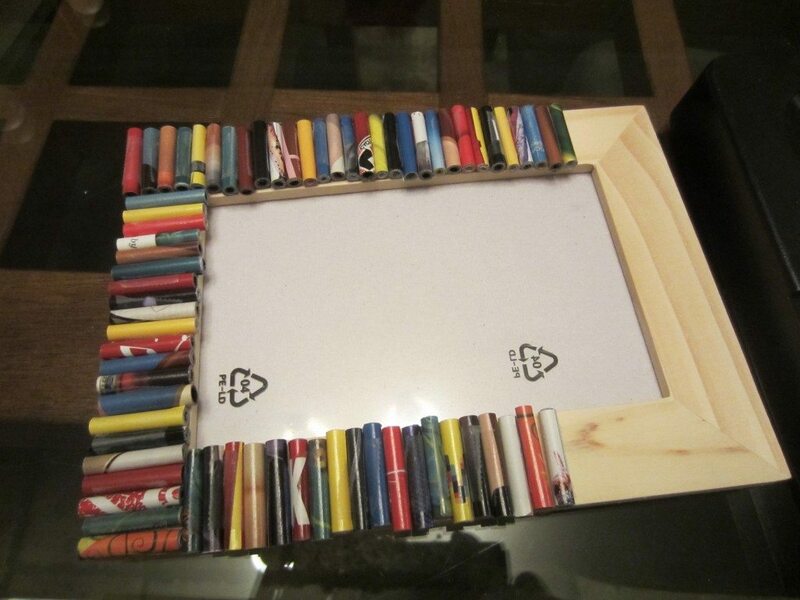 Hihi, this frame is a great idea and looks so pretty! 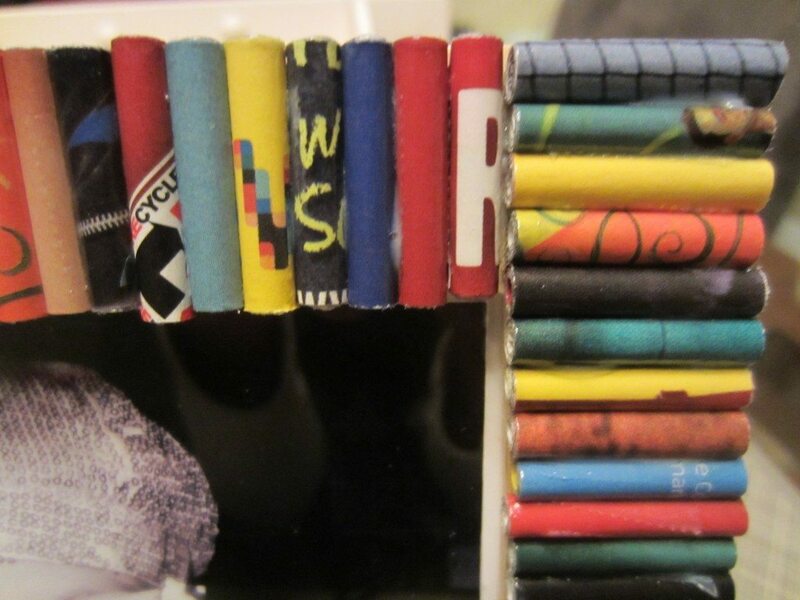 I chanced upon your blog recently and am blown away by all the fanstasic craft ideas you have here. Yes, I love art and craft and it’s awesome to read on all the different ideas. Have nominated your blog for the Versatile Blogger Award, details found here http://ahappymum.blogspot.com/2012/01/versatile-blogger-award-it-just-made-my.html. Keep the great work coming! Thank you so much, Summer! I am honored to receive your nomination! That is such a great idea to award mom bloggers you like and respect…hmmm. 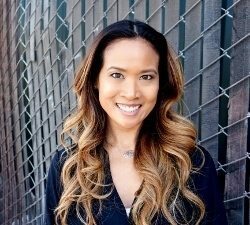 I read your story and I almost cried! I can very much relate to it. I love your writing style; it’s beautiful! I look forward to reading more of your blog! Thanks again for the honor! 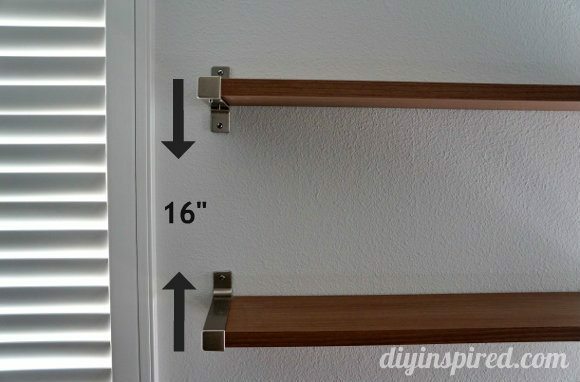 You must need some serious patience for this…but it looks great! Thanks for providing us the step-by-step guide to creating this beautiful masterpiece. The idea behind this art can also be used in other crafts like home decors and small organizers. 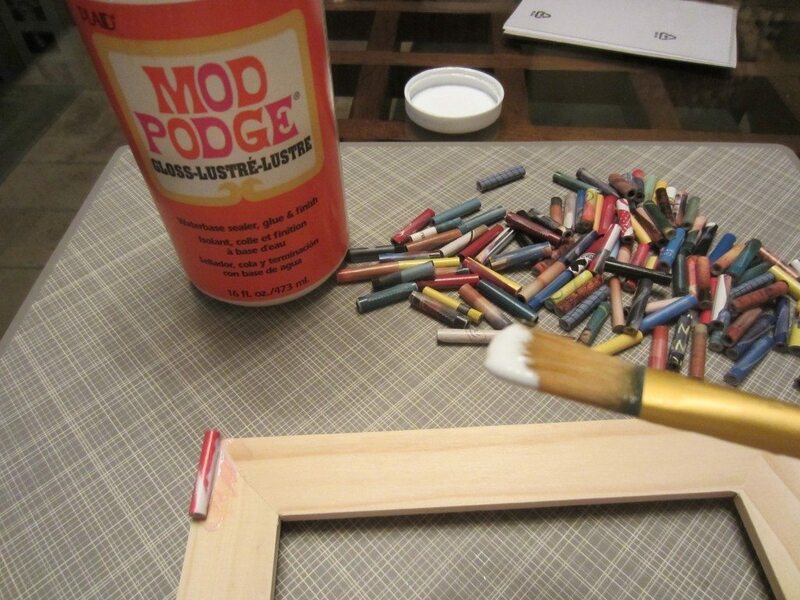 Love this and I love any excuse to use mod podge. Thank you Valerie! This frame has lasted through a few moves too!